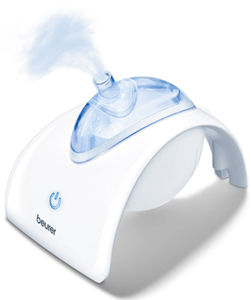 The Beurer IH40 Nebuliser is an ultrasonic nebuliser that treats both the upper and lower airways. Nebulising and inhaling medication prescribed by your GP helps to prevent illness as well as treat and alleviate symptoms, speeding up your recovery. The high frequency vibrations of the IH40 are great for sending the nebulised active agents directly into your lower airway. The IH40 is perfect for treating a range of respiratory disease, including colds and asthma, at home or on the move. Breathe in slowly and deeply for the full benefits, and breathe out normally. It is mains operated and can be disinfected easily between uses. The Beurer IH40 Nebuliser helps look after you when you are feeling unwell. The device has an automatic shut off after 15 minutes of use, and will also automatically switch off when there is only a small amount of medication or fluid left. What do you get with the Beurer IH40 Ultrasonic Nebuliser? Included with the IH40 is an adult and a child mask, connector for the masks, mouthpiece, hose and storage bag for accessories. Children must be supervised while using a nebuliser. Do not use powdered medication. Using medication with this product should be used under the advice of your GP. Technical information: Medication container volume max. 8ml, water tank volume max. 20ml. Nebulisation capacity approx. 0.4ml/min. For the treatment of the upper and lower respiratory tract. For use in colds, asthma, respiratory disease. Ultrasonic atomiser with medication container, mouthpiece, adapter, adult mask, children's mask, mains plug, storage pouch for accessories, instructions.